Do you ever wonder if you can paint flowers? I'd never painted a flower in my life, until today. I would look at other artists flowers and be both fascinated and repelled. Especially in watercolour, I would stare and dissect and try to figure out how each petal got that way, and how the light played on leaves and whether I thought they did a good job. Then I imagined people staring at my painted flowers that way, and would decide to leave flower painting for later. Again. But painting flowers also feels like a right of passage, in a way. Just one of the skills, like life drawing, that you need to become a well rounded artist. (Life drawing = my kryptonite). I found two books on botanical watercolour painting in the Hamilton Library, read through both and thought I would give it a whirl. Some flowers mean so much to me. 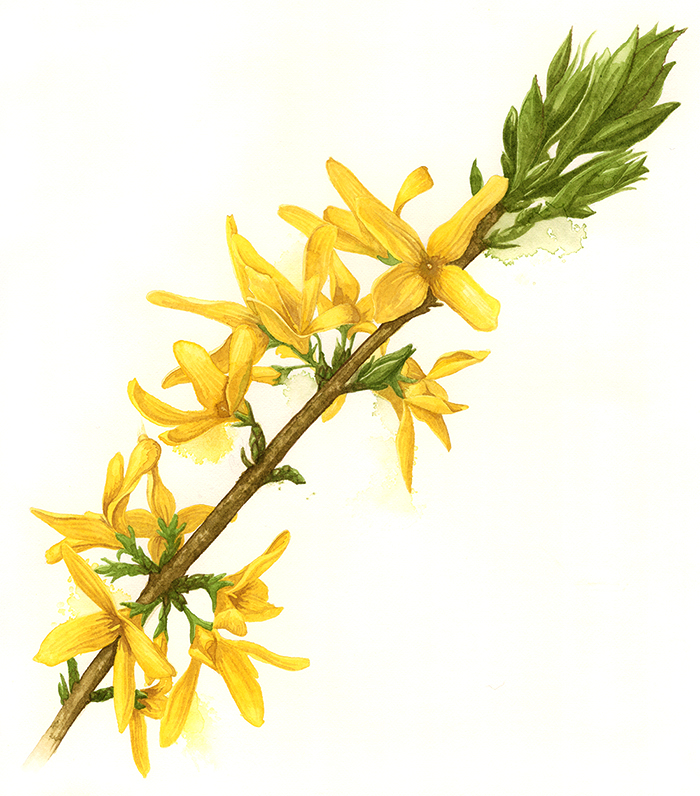 We had a huge Forsythia bush outside of our house growing up. We would always pose for pictures in front of it, so it makes me think of my dad. And spring. I'm thinking of selling this original watercolour, and possibly some prints... would people be interested in flower prints?